Dr. Urs Schaffner, who is supervising lead author Hailu Shiferaw for his Ph.D. studies, contributed to the Scientific Reports published paper 'Modelling the current fractional cover of an invasive alien plant and drivers of its invasion in a dryland ecosystem', which shows that the Prosopis invaded 1.2 million ha of grassland/shrubland in just 35 years. The fractional cover map produced by Mr Shiferaw not only provides information on the current distribution of Prosopis in the Afar Region, it also shows the percent cover of this alien tree across the invaded range. Hailu Shiferaw, from the Water and Land Resource Centre of Addis Ababa University, Dr. Schaffner and colleagues from Botswana University of Agriculture and Natural Resources and University of Bern, Switzerland, believe the main drivers for the invasion are river courses, road networks and village vicinities. The scientists, who modelled the spread using a Random Forest algorithm in combination with satellite data, also suggest that the migration of livestock and wildlife could have contributed to the distribution of the woody weed but state this claim requires further investigation. During the 19th and 20th centuries, various species and hybrids of Prosopis - native to South and Central America—were planted in areas outside of their native range including Australia, southern Asia and eastern Africa. The aim was to provide firewood, charcoal, fodder and timber to stabilize soil in degraded ecosystems and prevent desertification. While the first introductions in Ethiopia were made during the 1970s and 1980s, problems soon arose in the early 1990s when the tree started invading croplands, grasslands, riverbanks and roadsides—causing significant environmental impacts and a source of conflict among pastoralist groups due to the effect on dwindling grazing land. 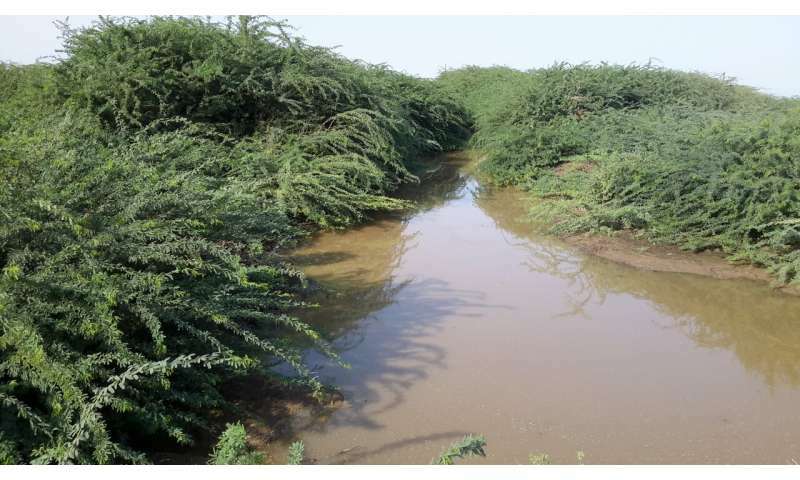 Mr Shiferaw said, "Our study suggests that river courses, particularly during flooding events, are known to serve as modes of transportation of Prosopis pods and seeds to downstream areas—a process otherwise known as corridor dispersal. "In particular, our findings reveal that the invasion of riparian habitats along the Awash River will continue downstream, thereby, quickening the loss of drought-season grazing areas which may aggravate conflict among pastoralist communities." The researchers say that despite the potential benefits of Prosopis, by way of firewood and charcoal, Ethiopia has declared it a noxious weed and has recently published a Prosopis management strategy to try and tackle it. "The Random Forest regression can help produce accurate fractional cover maps of Invasive Alien Plant Species that help explain their current abundance as well as predict future invasion patterns," Mr Shiferaw added. "Fractional cover maps help us identify areas with early stages of invasion, where Invasive Alien Plant Species management is still relatively cheap but the benefits are high. We propose that the establishment and interpretation of fractional cover maps of this nature should become a key component of management strategies at the regional and national scale."